Satiating famished masses strolling through Citygarden and pouring out of office complexes like Wells Fargo, food trucks are no longer a novelty but a permanent fixture on the St. Louis food scene. More than 70 wheels rolled out in the last year as a fleet of new trucks took to the streets, parking lots, festivals and parks. Spatula-wielding, paper basket-slinging operators might make it look easy, but not all trucks are created equal. We hunted down those that opened between April 2015 and 2016, anonymously stood in line and tasted the fare. Based on how well the truck communicated with the public (Don’t make it hard to get paid, people. ), how fast and accurately food was handed over (Service isn’t only important indoors.) and most important, if the food was memorable enough to bring us back for more, we narrowed our list to the six best new food trucks in St. Louis. We’ll see you in line. Move the palate and precision of Cardwell’s chef de cuisine to a food truck, and you’ve got Frankly Sausages. 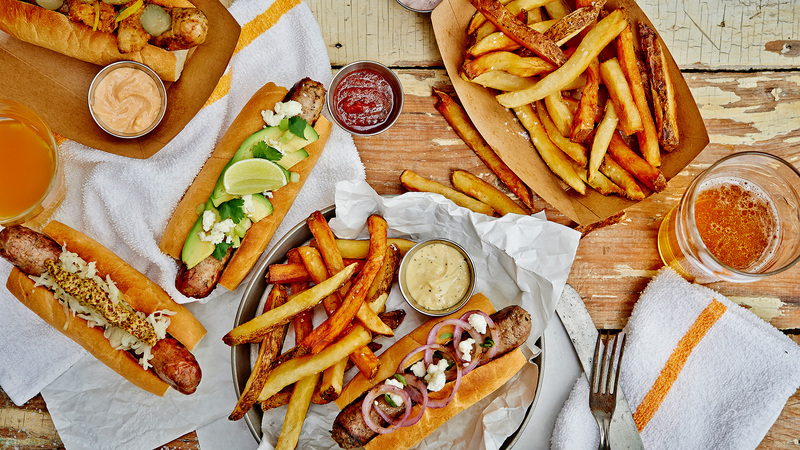 Co-owner and chef Bill Cawthon cranks out house-ground, handmade lamb, chicken, beef and pork sausages with toppings that range from classic house-made sauerkraut and coarse-ground mustard to feta and grilled red onion. Frankly Sausages regularly joins the Citygarden fleet during the lunch hour and parks outside Six Mile Bridge Beer in Maryland Heights some nights, so you can enjoy a beer with your brat as the culinary gods intended. – C.K. Communication Almost daily communication on Facebook and Twitter, even when the truck isn’t rolling that day keeps us engaged and hungry for more. Service Fast, informed and quick to recommend from the day’s offerings. What to get Keep an eye out for the chile verde sausage, featuring house-ground pork topped with just enough vibrant avocado and tomatillo relish, queso fresco and fresh cilantro to accent, but not overpower, the juicy sausage. And yes, you absolutely want fries with that. Hand-cut russet potatoes are brined and double-fried for what just might be the best order of french fries in St. Louis. Get Korean food on the fly at K-Bop. 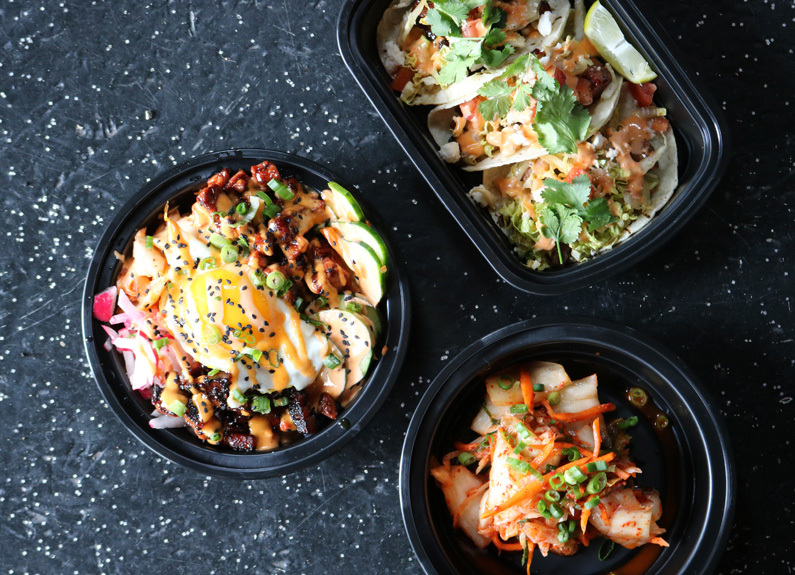 From downtown STL to business parks in West County, K-Bop delivers “cup bop” rice bowls served in bright yellow cups sporting a smiling, spoon-and-chopstick-wielding rice cloud logo. There are seven kinds of chicken, beef, pork or tofu cup bop options with sauces ranging from teriyaki to spicy Korean barbecue. Each bowl comes with fresh vegetables, Korean sweet potato noodles tossed in sesame oil and soy sauce and a choice of white or brown rice. Freshly prepared, expertly seasoned and served in a hurry, K-Bop is generously portioned and pocketbook friendly. – K.S. Communication Current, accurate and thorough. Follow K-Bop on Twitter and Facebook or check out the truck’s weekly schedule on its website. Service Fast and friendly. It’ll take you longer to get to the third-floor vending machine than to nosh at K-Bop. What to get Go spicy. Order the pork made fiery with a Korean red pepper base or the equally satisfying spicy tofu. 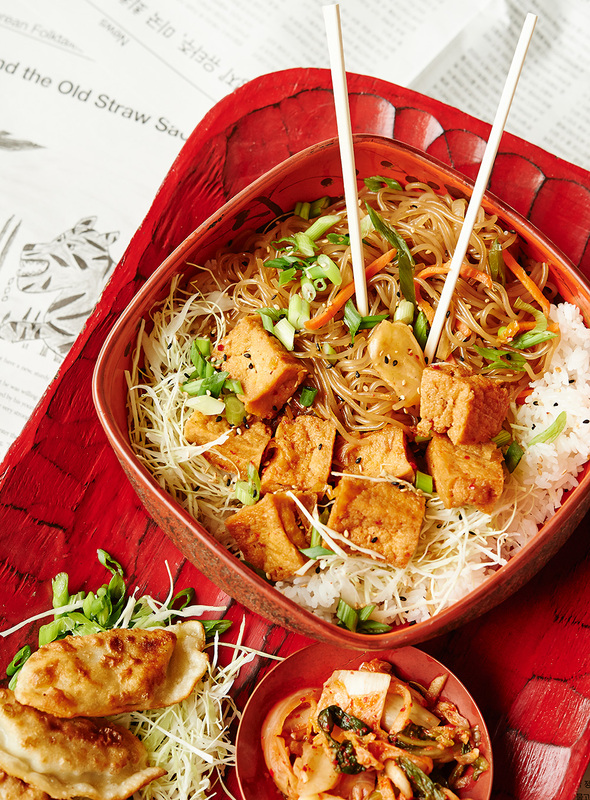 Big chunks of deep-fried tofu are tossed in a sweet-smoky gochujang-based sauce and piled atop rice and noodles. Owner Samantha Mitchell makes use of her experience in the kitchen at the hallowed Annie Gunn’s in Chesterfield by practicing local, seasonal sourcing and employing nose-to-tail butchery. 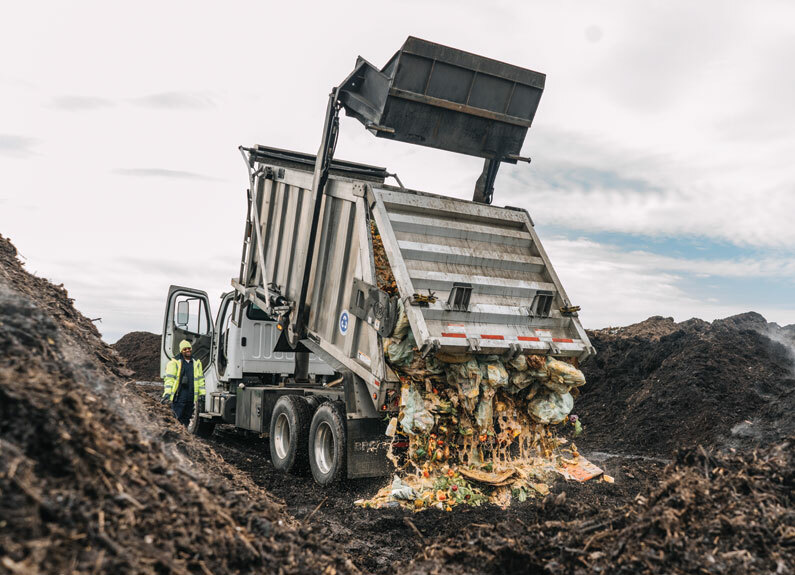 From farm to truck to table, Farmtruk slings high quality, mobile American fare from brisket to vegan tacos to hand-held chicken potpies. – K.S. Communication The truck is a little more than 1 month old, and so far so good. 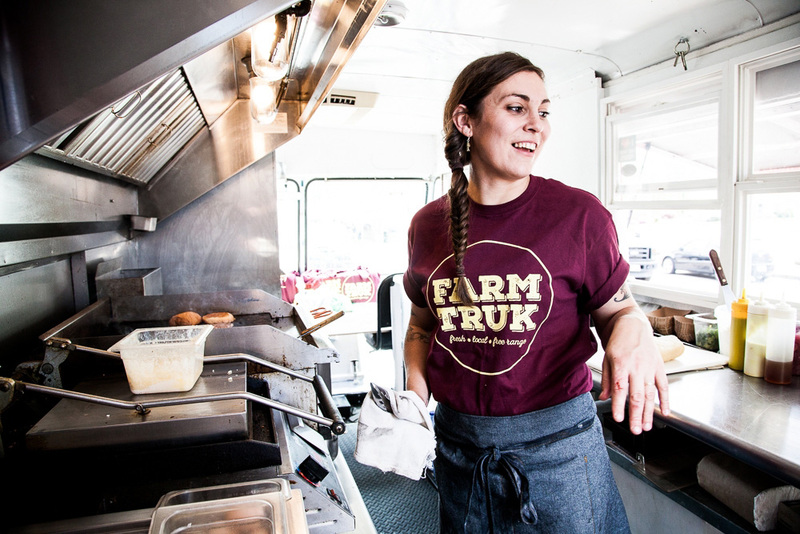 Locations are announced on Facebook, Twitter and Farmtruk’s website, which includes a sample menu of her frequently rotating offerings. Service Friendly and knowledgeable. Despite a long line on opening day (a great sign), Mitchell kept cool under pressure, dishing out lunch after lunch. What to get Don’t miss the savory beignets. These fried delights are stuffed with pork sausage then drizzled with a honey glaze, hot sauce and a spiced powdered sugar for a steamy bite of sweet-savory satisfaction. If you opt for a side, the creamy mac and cheese with its crunchy, garlicky breadcrumb and bacon topping is a good choice. 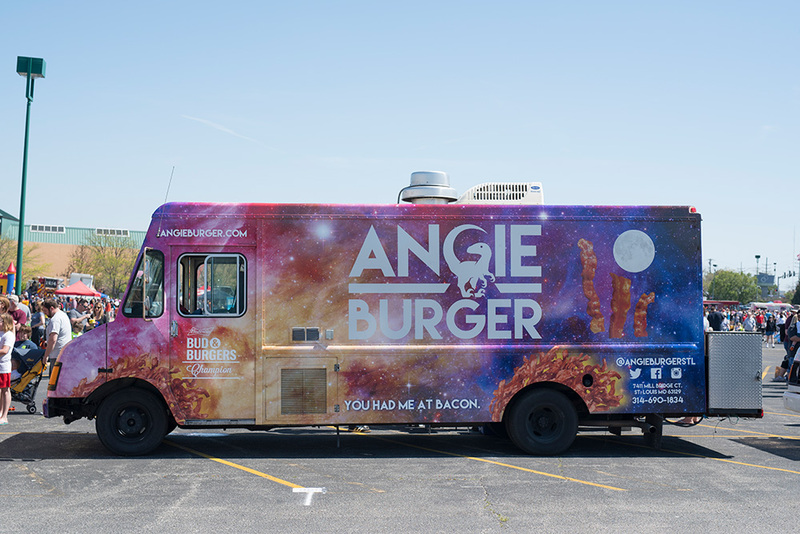 Riding the wave of her Budweiser Bud & Burgers competition victory in July 2015, Angie Saville now slings her award-winning burgers from a psychedelic food truck decorated with colorful galaxies, undulating bacon and a velociraptor. Burgers and tater tots are both available with your choice of toppings. 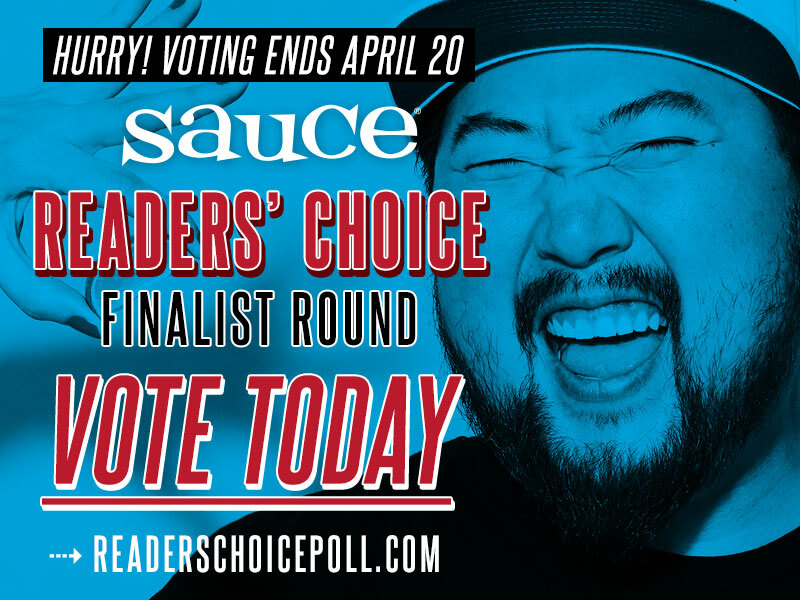 Yes, the menu is essentially two items, but they’re both customizable – and prize worthy. – K.S. 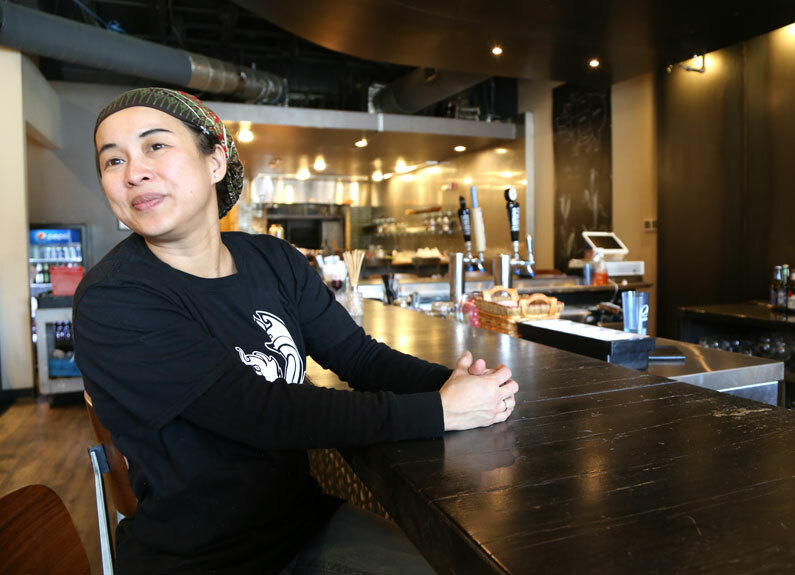 Communication Angie Burger is a newcomer to the scene, but burger buffs won’t have trouble finding the truck. Check Facebook for the most current information. Service The focused menu lends itself to swift, polite service. On one visit, we had to wait for gravy to be made for a tater tot poutine, but walked away with a free extra order of tots for our trouble. What to get It’s painted on the truck: Get the Angie Burger. This patty pops thanks to the addition of shredded cheddar, bacon, garlic and Budweiser in the ground beef. It comes topped with sweet caramelized onion, American and Provel cheese, brown sugar-maple glazed bacon, tomato and spinach, all held together in an onion bun. Mission Taco Truck brings a handful of highlights from the Mission Taco Joint’s Mexicali-style menu, featuring meal options for the hungry (two tacos and a side) and the hangry (three tacos and a side) along with a la carte tacos, burritos and quesadillas. From light Baja fish to rich beef brisket or savory grilled portobello, every palate and diet can find their taco at this truck. 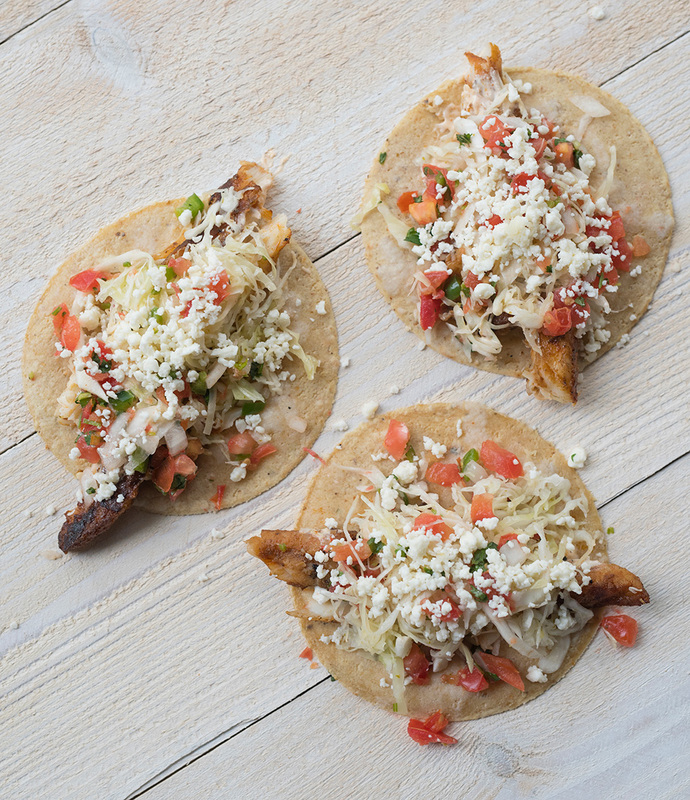 Order your favorites from the brick and mortar locations, or try something new with rotating taco specials, all with house-made tortillas, unique sauces and salsas. – T.L. Communication Solid. Follow Mission Taco Truck on Facebook and Twitter for the latest. Like to plan ahead? Check Facebook for the week’s schedule. If something changes, it is posted online so you won’t end up on a wild goose chase. Service Friendly and helpful. Don’t sweat long lines, because your food will be out before you’re done checking your text messages. What to get Go for the house-made chorizo taco, which comes topped with avocado, pineapple pico de gallo, pickled jalapeno and cilantro-lime crema for a complex, spicy but balanced bite. The grilled chicken taco is also a winner with ancho barbecue sauce, pickled red onion and mango salsa. Instead of a side of classic rice or beans, spend the extra buck and get the grilled Mexican street corn (or elotes) topped with queso fresco. Don’t let Pnoy Kings’ plain white truck deter you from the colorful barrage of Filipino flavors waiting inside. 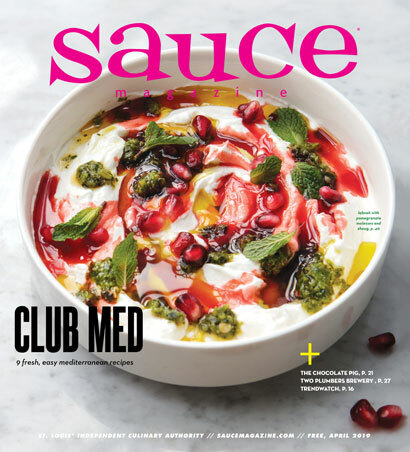 From classic, comforting chicken adobo to chicken inasal served on a bed of bright yellow rice, husband-and-wife team Maidi and Matt McClane turn out mouthwatering Filipino-inspired street food served in bowls or flour tortillas as burritos. – C.K. Communication Pnoy Kings posts regularly on Twitter announcing locations and, occasionally, daily specials. Service Friendly and accurate, especially when placing multiple orders. 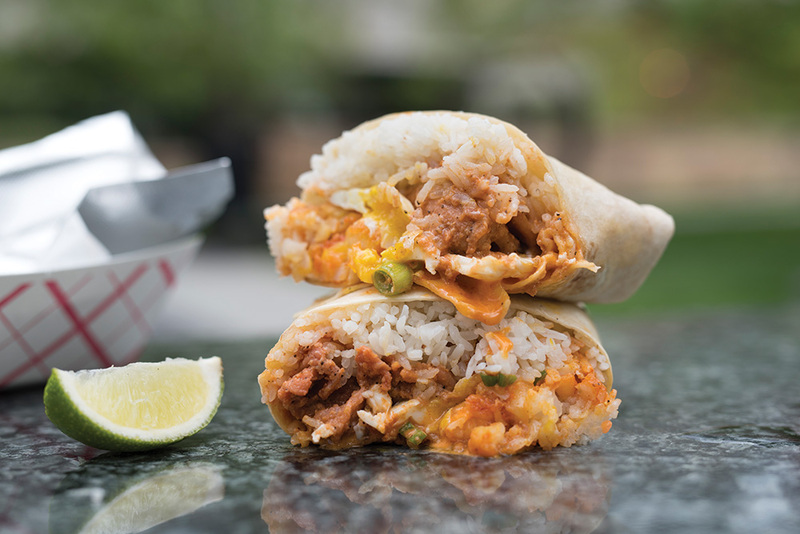 What to get Don’t miss the tocino pork burrito: A flour tortilla bursts with garlic fried rice, flecks of spicy red chile, green onion, fried potatoes and rich marinated pork, all enveloped in a sticky Sriracha aioli. And hidden inside this nap-inducing meal is a perfectly fried egg that bathes the rice in silky yolk.